Excel the art of website designing with our exclusive IT software development tutorials. Learn how to code, create, & build web applications from the foundations of object-oriented programming. From hundreds of video courses, choose the right one to help you! Buy it now for just $299 $29. 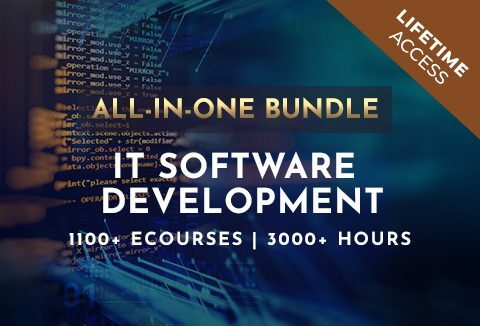 Why Choose IT Software Development All-In-One Bundle? Our IT software developer tutorials can help you learn to develop & create mobile apps, work with PHP & MySQL databases, get started with the statistical processing language R, and much more. Learn how to embed video, format text, design in CSS, create a content strategy & analyze user experience design. Learn to write clean code whether they develop in iOS, Android or Windows apps. With courses on SQL, Python, NoSQL, Object-relational mapping and more, you can learn database development from experts. Learn to develop, test and deploy on a more regular cadence. Implement rapid release cycles while mitigating the risks that come with moving quickly. Once your license is redeemed, all sales are final. On purchase of the product, an instruction document will be emailed. The steps to access this product are provided in the same instruction document. For A Lifetime At A Deal Price Of $29 Only!